The United States and its western allies are now "playing catch-up" against adversaries such as Russia and China after more than a decade and a half of focusing on counterterrorism operations, according to the State Department's point man on Europe. 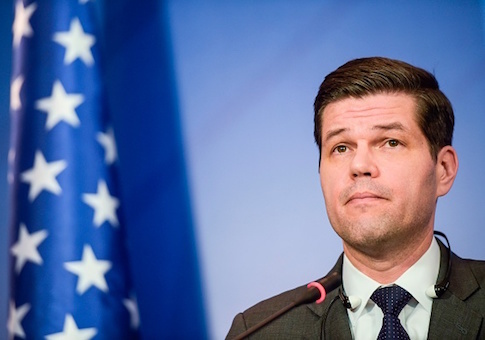 Speaking Wednesday at a conference hosted by the Institute for the Study of War, Wess Mitchell, who oversees the State Department's Bureau of European and Eurasian Affairs, said U.S. policy up until this year has largely neglected the return to strategic competition. "Unfortunately, I think we have been in a period of big power competition for some time, but I don't think that the United States has prepared itself for that adequately," Mitchell said. "I don't think we have—and much of the Western world has—acted on the basis of an assumption that we're part of a big power competition, but our competitors have been planning and acting on the basis of a big power competition and so I think we're playing catch-up." Mitchell endorsed the Trump administration's National Defense Strategy released in January, which declared a decisive policy shift away from terrorism and toward great power competition with "revisionist powers" such as Russia and China. Upon releasing the document, Defense Secretary Jim Mattis warned that U.S. military advantages have "eroded" in every domain of warfare. Though a decade of budget cuts, sequestration, and the inability of Congress to pass long-term budgets has contributed to the erosion, Mitchell said so, too, has the inability to recognize the reemergence of great power conflict. "The arctic is a great example of where the West is now playing catch-up and where, in this case, the Russian Federation was early in recognizing the resource potential of the arctic long-term and treated it as a strategic theater," he said. Despite the lag, Mitchell said the United States and its allies are now "very well awake to the fact that Vladimir Putin is serious" and are "rapidly catching up to the techniques and intentions" of the Kremlin. This entry was posted in National Security and tagged China, Military, Russia. Bookmark the permalink.